WHEN I VISIT MY SISTER who lives in Canada or talk with friends who live in the UK or New Zealand there is one thing they all can take for granted: What they’re going to do if they get sick. But for all of us in the United States we either have a job that offers affordable health insurance or we don’t. And if the latter, we are uninsured. There are 47 million people out there in this circumstance. I know some of them. You do too. And I worry that at some time in the future either I or my children will be among them. I have never understood why Americans are so ambivalent about something so basic to life in a modern civilized society — access to affordable, comprehensive, healthcare. But I wonder whether it is “The American People” in general behind this problem or special interests and a Congress that has so long accepted their contributions to maintain the status quo. When health insurance was invented easily within the lifetime of a Baby Boomer, it was a set of schemes created by physicians and hospitals to ensure they were paid for services rendered. Medicare came along and provided another way for providers to get paid. Then we saw a vast explosion in the healthcare industry. Hospitals grew and became more sophisticated. Quality of care improved. Physicians at last had good incomes and could take vacations. The cost of this more sophisticated healthcare increased so rapidly that people who once paid for doctors visits with chickens and a bushel of produce found themselves locked out of the system altogether. Then an outfit called Kaiser Permanente in California showed it was possible to create a highly integrated system of doctors, hospitals and clinics, charge people to keep them healthy, and make money at it in the bargain. The Nixon Whitehouse became enamored with it and soon there was legislation that created a place for United Health, Aetna, and dozens of other companies to make money taking care of sick people. Serious, serious money. In no time at all they joined the drug companies as the most powerful lobby of all time. In the succeeding years the objective of the entire system shifted from taking care of sick people to making money for rich people. Americans seem, again, to be calling for reform in the healthcare system. The major Democratic candidates began issuing policy statements and publishing their reform plans on their websites. They are fairly similar to each other so it is not really a question of which candidate has the better idea. The question is, which candidate has the best chance of getting his or her idea passed into law. That person, in this writer’s estimation, is Sen. Hillary Clinton. For weeks and weeks now the people in this household — four Minnesota Democratic caucus participants — have been sitting on the fence with regard to Barack Obama and Hillary Clinton. Sen. Obama certainly is an exciting candidate. I can push a button on my computer right now and listen to then Illinois state lawmaker Obama deliver his outstanding speech to the Democratic National Convention in 2004. He is a skillful politician and orator and could make a very exciting President I think. Sen. Clinton, on the other hand, has been working away in the cloakrooms and corridors of Congress getting real legislation made into law. She has worked hard. She has been effective and she is highly regarded by her constituents in the state of New York. When it comes down to hard tack politics, I believe Hillary Clinton can best use the bully pulpit of the Presidency to advance a progressive agenda. And after all of the shouting and speechifying is done, that’s what it’s all about, isn’t it? Getting things done? FOR ME THE HEALTHCARE CRISIS IS EMBLEMATIC of a much larger problem in this country. There seems to be a fundamental inability of government to recognize the plight of its citizens and to take action on their behalf. Barack Obama has not had an opportunity to show me what he can do. Hillary Clinton has. This government faces a host of intractable problems, many of them created by the malevolent and incompetent Bush administration. The Iraq war isn’t going away anytime soon. The “War on Terrorism” isn’t going to be resolved no matter how good any President might be. However a determined and skilled chief executive can certainly get something done about the state of our healthcare system. There are no forces external to the United States at work. It is not money standing in the way (we pay far more per capita for healthcare than Canada or the UK). Only politics. 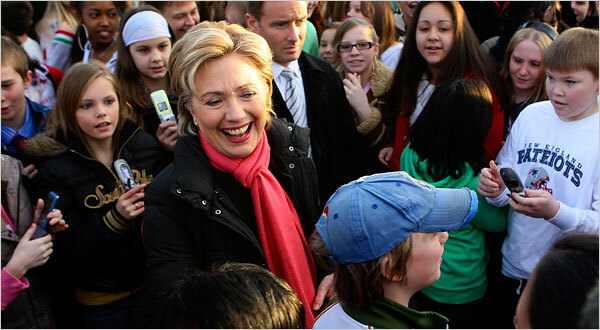 In Hillary Clinton we have someone who is, very much in her own right, a master politician. She compromises in ways that Progressives do not like. She manages to get laws passed that Republicans do not like. She shoots down the middle keeping in mind her duty to the poorest and most vulnerable among us. If Barack Obama manages to get to the Whitehouse he will have to move to the center as well, and compromise and accommodate. If I have learned anything about elected office I know this: campaigning for office is one thing; governing is another. The moment you take your hand off that Bible you have constituents who voted for you and constituents who didn’t. Let the compromising begin. I want someone who can get the best deal for the American people — especially those most vulnerable among them — and I believe that person is Sen. Hillary Rodham Clinton. P.S. What do you think? Share your thoughts right here. If you’ve not commented before, you will automatically be asked to register. It takes just a few seconds and you only have to do it once. Then you will be e-mailed a password and you’re off and running. You can even add your own posts if you wish. This entry was posted on Wednesday, January 30th, 2008 at 4:09 pm	and is filed under Political Endorsements. You can follow any comments to this entry through the RSS 2.0 feed. You can leave a comment, or trackback from your own site. Patrick — All three of us support Hillary. For me it was very tough to decide, because both campaigns were arrogant and unresponsive leading up to the Iowa caucuses, and I was devoted to Chris Dodd and Joe Biden, who I still feel are head-and-shoulders above the rest of the field in legislative accomplishments and acquired stature and wisdom. But they fell flat in Iowa, and I was left to ponder the survivors. For some unknown reason I was never pulled toward Edwards. although I admire him very much, and would have supported him, had he become the nominee. Rovian-type inuendo and decimation of your opponent’s strengths. Judy and have talked about all this at great length, and we are just put off by Obama’s self-righteousness, although again, I will support him in a heartbeat over any of the evolution-denying, global warming-denying, choice-denying, borrow-and-spend, war without end Repugnibums. I must say, that about 90% of the time, you and I are in agreement on issues. However, on the issue of Hillary, we couldn’t be farther apart. She scares me. I wouldn’t have said that a year ago, and almost jumped on her bandwagon. I could wax eloquent on the subject, but the following link says it much better than I could. But, it represents my feelings about Hillary (by the way, I was a strong supporter of Bill, but his recent campaign protocols have disappointed me immensly). As far as Obama is concerned, I don’t find it the least bit disingenuous for him to have been endorsed by Ted, Caroline and Patrick Kennedy. Yes, Ted is older than you and I (glad someone is) but Caroline and Patrick are younger. I find the fact that one such as Ted in his generation finds it refreshing to have someone such as Obama to endorse. He hasn’t endorsed candidates as a matter of course, so this is truly a significant event. I find Hillary to be supremely disingenuous. She has yet to apologize for voting for the Iraq War, and continuing to vote for funding, while talking about ending the war if she becomes president. Hypocritical, in my estimation. It was Hillary and Bill who first played the race card in this campaign (she also played the gender card claiming the “boys” ganged up on her because she was a woman). Give me a break. She is so beholden to the same corporate power brokers who funded George W that I can’t tell if she’s a Democrat or a Republican. If she’s elected, when will the quid pro quo begin? She is in the pockets of the War profiteers and lobbyists, and that’s scary. For one who truly wants this war to end, I cannot envision how that will happen with Hillary at the helm. That being said, I will vote for her in preference to ANY republican they can throw at us, but with Obama, I believe we have a new vision for the future, new hope for reconciliation, and the possibility that we may continue to exist on this planet. All good reasons to vote for him. Anyway, read the article. I know you have it in you to see the light. I still love you, even when you are wrong. That’s a great article, Chuck, and I couldn’t agree with your comments on Obama and Hillary more. I was Terry’s partner on the fire department for his last year and a half or so, and I’ve known him for twenty years or more, so I’m able to forgive him when he has these lapses in judgment. I truly believe he will come to his senses. I, too, will vote for Hillary if she becomes our candidate, but I have much more faith in Barack and his ideas. Er, I would have preferred Al Gore. But if I can’t have Al Gore, I would have preferred Edwards. But if I can’t have Edwards, I would prefer Obama. But if I can’t have Obama, I’d prefer whoever is left against any Republican. Trust your gut Mary. I like Obama but have some misgivings about his depth of experience. But I agree with you, the debate was what it needed to be … overall positive. They handled themselves well. We noticed the Obama baiting by Blitzer as well and I think that was getting close to the edge. At the same time, it is good for Obama to be put on the spot so he can show how he handles himself … ’cause presidents have to do that. I thot Hillary did a good job of demonstrating her strengths and she gave a decent explanation on the Iraq vote which Obama has been pounding away on. I thot Obama was a bit platidudinous in some of the stuff he said. But they both did a good job. We watched the thing on the web because we don’t have CNN. hmm – her Iraq statement has never convinced me, Patrick. I see it now as I saw it at the time – a political decision. And that she continues to be unable to say “it was wrong” or “I made a mistake” reminds me way too much of George Bush. The Blitzer baiting was disgusting – really tacky – good on both of them for resisting him. I had more respect for her tonight nothwithstanding my basic distrust than in the past. Part of my distaste is from the emotional “dynasty” thing – and also that I don’t want a return to the Clinton years when NAFTA did so much damage to so many in this country. Barack did say some cliche stuff – I agree. And Hillary got some good lines off which were humorous as well as on target. I have made an emotional commitment to Barack. I might not have done that if I hadn’t known about Hillary’s lobbyist money. I guess most of us have an issue that we can’t get past. For me it is the war and lobbyist money. Hillary fails miserably on both of those. Edwards at least was able to say “I was wrong.” about the war. Edwards might have been my first choice had I not fallen in love with Barack’s larger message and his continuing focus on the fact that “we” the people have a responsibility. The year was 2007. My school — ARTECH Charter School — had chosen to create new mission and vision statements. To do this, the school formed a committee of parents, teachers, and students. I was one of the two students on this committee. As we discussed at length what the school should be doing, we were mostly in agreement. We all agreed, for example, it would be great if the school tried to reduce its carbon footprint. But writing “environment commitment” into a vision did nothing. It made words, not action — without measurability, there’s no point in specific goals. Fast forward a year and a half. As I sit here, watching the January 31 debate on my computer, I see a similar problem between Senators Obama and Clinton. Obama is more than happy to say, “I strongly support pink bunnies. Pink bunnies are core to me and core to America.” He’ll even say it in that wonderful “inspirational” voice. Clinton responds with specifics, she responds with measurability. She doesn’t say just say pink bunnies are dandy, she says that we should increase pink bunny spending by $25 billion by 2010. That in 1995, she chaired the Pink Bunny Coalition. That she supported fifteen bills that brought pink bunnies to kids in poverty. There’s also the one major policy difference between Obama and Clinton. It’s what Patrick talked about in his post: healthcare. Clinton has a practical, attainable, universal plan. Barack Obama does not have this. He thinks health care (like pink bunnies) is a great thing, but he won’t put his money where his mouth is and say it needs to be government-run and mandatory. I suppose to make inspirational, but ultimately meaningless statements is what Obama does best. As a citizen and as a first-time voter, I want substance. I want a president who says things that can actually be delivered. Hillary Rodham Clinton is that person.